Tag Archive | "Rabbit Snails (Tylomelania sp.)" Rabbit Snails (Tylomelania sp.) are a genus of freshwater gastropods endemic to lakes Poso, Matano, Towuti, Lontoa, Mahalona, and Masapi on the Indonesian island of Sulawesi. Rabbit Snails are known to tropical fish keeping enthusiasts by a variety of names including the Giant Sulawesi Snail, Orange Giant Sulawesi Snail, Golden Giant Sulawesi Snail,Mini Golden Rabbit Snail, Golden Rabbit Snail, Elephant Snail, Sulawesi Snail, etc. All species come from Lake Poso and the Malili Lakes system, Sulawesi, Indonesia and all are extremely rare and difficult to obtain in the United States. All species of Rabbit snails, like Mystery snails, have both male and female genders and an operculum. They have long, whorled, unicorn horn like shells that are colored light brown to black with a white crown, and strikingly beautiful body colors that can be bright orange, yellow, cream, black with yellow or white dots, black with yellow tentacles, black with yellow spots, or any combination between. Many of the Rabbit Snails numerous different color forms are still awaiting formal description. Their long, ridged, conical shells vary in appearance, and their small eyes set underneath the tentacles on their long, tactile (elephant nose like) snout lends to their overall rabbit face like appearance, which is undoubtedly how their common name was derived. 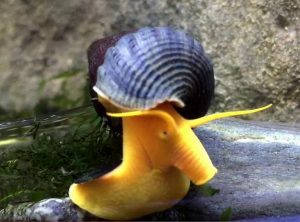 The Gold Rabbit Snail (Tylomelania gemmifera) found exclusively in Lake Matano, appears to have a bunny like “face” with an elongated head, drooping yellow antennae “bunny ears,” and a long, down turned mouth. Another variety has a black body with yellow spots, yellow antennae, and yellow lips. All are peaceful scavengers and one of the largest freshwater snails in the hobby, with some species reaching over 4 inches in length. The adaptable nature of Sulawesi snails allows them to be housed safely with almost any species of fish, shrimp, snail, and live plants however, because they are from a tropical climate, aquariums with high temperatures are necessary for them to thrive. Good tank mates include other types of snails like Nerite Snails, Mystery Snails, Golden Rabbit Snails, etc., dwarf shrimp like the Blue Velvet shrimp, Neon Yellow Shrimp, Sakura Red Cherry Shrimp, etc. and any non aggressive fish species. to diffuse overhead lighting. Avoid overcrowding the tank with too many plants. Water quality and temperature is important with Rabbit Snails and like other snail species, they are extremely sensitive to copper in even minute amounts. 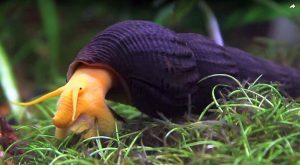 Under ideal water conditions, Giant Sulawesi snails have been known to breed in an aquarium environment, but at an extremely slow rate. Unlike many other snail species, they will never create an overpopulation problem in your tank. Their method of reproduction is somewhat unique. When the male impregnates the female, an embryo is formed in a pouch or pod inside the shell of the female, where it receives nutrients from the female until it is fully developed. When the embryo, or pod, is fully developed, the female will expel 1 to 3 egg sacs (or pods) into the water, where the casings of the pods dissolve to reveal a miniature version of the adult snail. Tylomelania Sp. give live birth and produce one round white pod (with one to three baby snails) every six weeks or so which in the snail world, is an extremely slow reproduction rate . In an aquarium environment, Sulawesi snails make excellent janitors. They are constantly seeking out leftover food and vacuuming up detritus from the substrate. 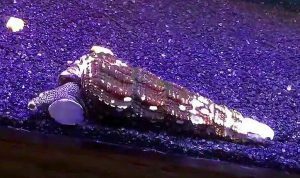 They will eat algae, plant matter, and detritus from the bottom as well as algae wafers and invertebrate pellets. Absent a good growth of algae in the tank, they have been known to occasionally munch away on plants like Java Fern . 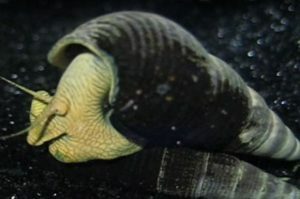 These snails also have a penchant for trailing after other aquatic snails in the tank and grazing on the slime trail left behind (similar to terrestrial snails and slugs) by the other snail. Rabbit Snails (Tylomelania sp.) are occasionally available from online suppliers and from specialty tropical fish keeping shops however, they are almost always on back order. Purchase size is from 1-1/2″ to 3″ or more in length.